Typical poor Sony handset, they really should stop. ps... comparing a capacitative pen vs the samsung spen is like comparing a tricycle to a motorcycle. i feel so bad for sony... such a bad timing for a phablet. Right when the mother of all phablets is about to be announced lol. With spen support for wacom techonlogy. come to papa. Why would gsmarena not compare the camera to the Lumia 920 or 925? Does a 1080p display really make such a big difference that they are incomparable? The subtle airbrushing fading lines and colors are thanks to the pressure level controls which are not present in the mono input of the "any hard object" input of the Z Ultra - that is only meant for scrolling and writing uniform lines. Sony missed the point of a Wacom system for artists like me. The S Pen is a serious integration with the Note series that ordinary people don't realize. It's not a toy. AnonD-159698, 04 Sep 2013Lolz.. You are gonna watch the carton show for Note III launch kid. hahaha.. Gud luck. Let me ... morePoor die hard fan of Sony. All that I stated before comes from the extensive overall review of GSMArena itself. Mind telling me which statement that I give that's wrong? This phone can't even go against Acer's Liquid S2. While the Note II was the highest rated smartphone ever. The Note 3 will surely eat this phone alive. Be honest to yourself, fanboy. AnonD-130551, 04 Sep 2013Apparently you didn't read the review at all, because your whole post is wrong. Sad that so... moreWhat? What I posted are false statements? Do you even have any of these devices? Nice review, but i wonder if GSMarena use a stamina mode to measure the battery life performance..
We'll see when note 3 review released, just want to see the real benchmark test..
Just posting to say Thank You GSMARENA for such a great review. You're guys doing a great job! In any case, gorgeous and impressive device. Will wait for the opponents to make a final decision. Ultra is a winner so far IMHO. AnonD-168700, 04 Sep 2013I take the last sentence of my comment back, obviously, you're the biggest joke! Lol Have fun ... moreLolz.. You are gonna watch the carton show for Note III launch kid. hahaha.. Gud luck. Let me know if you need more toys like note III. Sammy launched S4 and mega as well for college kids. AnonD-168700, 04 Sep 2013I take the last sentence of my comment back, obviously, you're the biggest joke! Lol Have fun ... moreOh Really.. Then why are you trolling here. Go on Note page and dance. S-Pen is a joke. Thats for kids. But a good attempt by Sony though. TheNeighbor, 04 Sep 2013So true about the battery life! You can't much with the shorter screen on use. With a fixed ba... moreApparently you didn't read the review at all, because your whole post is wrong. Sad that some people have nothing better to do than hate on companies for no logical reason. AnonD-168700, 04 Sep 2013Later today, people all around the world will see how this phone bow down before the true mons... moreYou're on drugs if you think the Note 3 is even in the same league as this phone. Samsung phones look like they come from Toys 'R Us. The Note 3 has a pathetic small screen, not even 6 inches, no water resistance, the Exynos Octa is a massive fail, and you can't write on it with anything but the S-Pen. Did I mention the phone is hideous? Have fun with your toy. Later today, people all around the world will see how this phone bow down before the true monster when it is released. 8MP, no LED flash, pecils or some other pointed objects for stylus (it's like the 90's all over again), bad speaker performance, and a joke of a battery endurance. Does Sony really expect this thing to stand it's ground before the 3?! That would be the biggest joke. What a coincident! 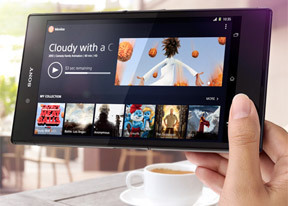 The Xperia Z Ultra review at GSMArena came out on the same day as the launching of the Note 3! I hope this is really a coincident because the Z Ultra has been out for some time now. this phone is soo big that its gonna be used more like a tablet than a phone, and 5 hours web browsing is very disappointing. 52 hours endurance is not good enough, might aswell buy a nexus 7 3G, almost the same size and cheaper to with a much better battery life and louder speakers. AnonD-146403, 04 Sep 2013you are willing to pay $1000 just for a flashlight? wow, you are so rich! how about just buy o... moreIf I could buy one for $2 as u said, and install it inside the Z Ultra without damaging its aesthetics and performance then I guess your comment would have a lapse of sense. :P . Most of the pics I take are indoors, at home, restaurants, clubs, friends houses, museums, etc. Not being able to do that because of lack of flash is more than reason enough not to buy a device I would be carrying with me 100% of the time. How about the display issues (the green lines and the blank screen) that have been bothering so many users before this? Have those been solved?